【SUPERB MANDOLINE SLICER】Whether you want to grate cheese, slice potatoes, cucumber, carrot, ginger, garlic, fruit or even julienne zucchinis and carrots, this efficient vegetable mandolin slicer will do it all! 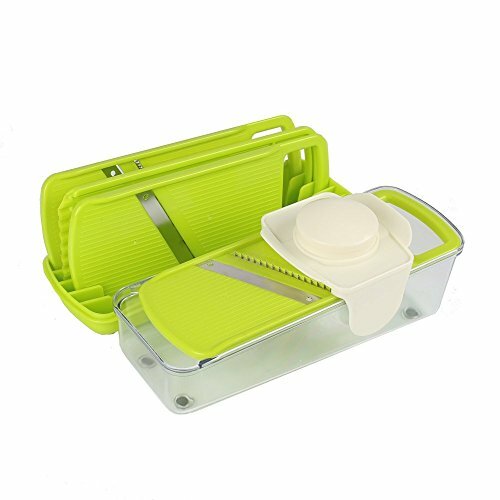 【4 IN 1 VEGETABLE SLICER】Detachable Mandoline Slicer, meet all of your needs of Cutting, Slicing, and Chopping. 4 Interchangeable Blades (2mm Slicer, 2mm & 5mm Julienne, Grater), Used for Cucumber, Carrot, Garlic & Potatoes. 【UNIQUE BLADE STORAGE】It has its own container for the blades to fall into so there isn\'t the awkward container that doesn\'t fit and make a mess, never loose them or spend time looking where did you put them. ALL the blades are locked in place by a raised notch. To remove the blade simply lift up slightly and pull it outward and it easily slides out. 【ULTRA SAFE MATERIALS】Tested by multiple users and health authorities, our slicer is made from top-quality, premium ABS plastic, BPA free and blades are made from food-grade material and 304 & 420 stainless steel. Non-stick and non-toxic. We can ensure a healthy kitchen cooking! 【EASY TO CLEAN AND DISASSEMBLE】 It can be fully disassembled for easy cleaning on the top shelf of your dishwasher, using warm soapy water to clean the cutter. After drying, it is ready for storing all blades and hand guard into the container safely. Enjoy and be happy in slicing!!! !